Developed by a team of scientists at Yale, a new biodegradable nanoparticle, called a nanogel, delivers a combination of two therapeutic agents to tumor sites, significantly delaying tumor growth and increasing the survival rate of mice during testing. Yale University scientists have developed a new mechanism for attacking cancerous tumors that intensifies the body’s immune response while simultaneously weakening the tumor’s ability to resist it. The researchers report results July 15 online in the journal Nature Materials. Dr. Richard A. Flavell of Yale School of Medicine and the Howard Hughes Medical Institute collaborated on the project. Tumors — in this case metastatic melanomas, or spreading skin cancers — are adept at overcoming their host’s natural defenses, in part by emitting agents that disrupt production and operation of the immune system. 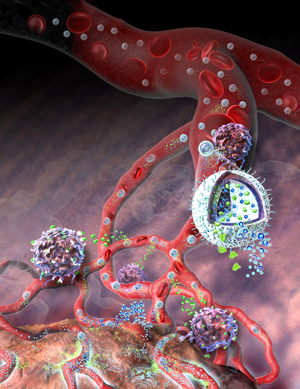 The Yale team developed a new biodegradable nanoparticle that delivers a combination of two very different therapeutic agents to tumor sites, gradually releasing the agents into the tumor vasculature. One agent, a large soluble protein called a cytokine, stimulates the body’s innate immune response. The other, a small-molecule inhibitor, interferes with the tumor’s ability to suppress the immune response. Other drug combinations are possible. The main challenge researchers faced was devising a particle that enabled gradual, sustained release of two therapeutic agents with very different properties: the protein, which readily dissolves in the body, and the small-molecule drug, which doesn’t. Researchers describe the materials and unique structure of their solution in the Nature Materials paper. Other authors are Jason Park, Stephen H. Wrzesinski, Eric Stern, Michael Look, Jason Criscione, Ragy Ragheb, Steven M. Jay, Stacey L. Demento, Atu Agawu, Paula Licona Limon, Anthony F. Ferrandino, David Gonzalez, and Ann Habermann, all of Yale. Support for the project was provided by the National Institutes of Health; the National Science Foundation; Yale University; the Howard Hughes Medical Institute; and the PEW Charitable Trust. Be the first to comment on "Nanoparticle Delivers a Combination of Therapeutic Agents to Tumor Sites"